Flying a quad is incredibly fun and exciting. Quadcopter flying is a fun, reliable, and affordable hobby today due to the advances in technology. Some pilots have mastered the art of shooting photos and videos from a bird’s eye view and others can perform amazing tricks and stunts. However, flying also requires some skill and you don’t want to lose your expensive aircraft when your quad is high up in the air and you suddenly lose control. That’s why many pilots now have GPS chips built into their drones. These GPS drones have assisted-flight features such as Return To Home feature, where you just flip a switch on the transmitter and the quad will automatically fly back and land where it took off from, and Position Hold, where you can let go of the sticks and the quad will straighten itself out and stay in one position. A quad with camera and GPS system gives you plenty of aerial options, because a quad on autopilot can capture aerial images and videos and video much better than any pilot can. Having a quad with camera and GPS system is crucial for multispectral imaging, 3D mapping, site surveying, crop monitoring and aerial photogrammetry. 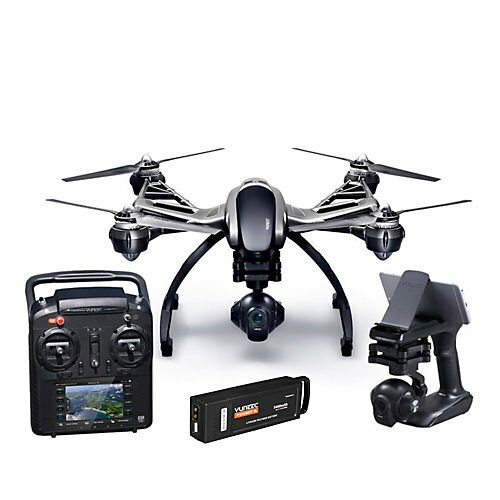 The 7 top quads reviewed here are full of innovation and they all have advanced GPS, autopilot systems and cameras which are top notch along supporting software. 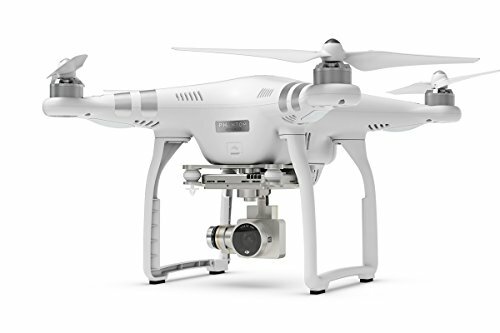 The DJI Phantom 3 Advanced is the improved version of the original DJI Phantom. A complete 2.7K camera and 3-axis gimbal system come integrated with the drone. The camera is capable capturing up to 12 MP still photos and the three axes of the gimbal give you pan and tilt control, and keep the horizon line level even as the drone banks. Also, pilots can view the action live in FPV (first person view) on their phone or tablet with Lightbridge 720p HD digital streaming and the DJI Pilot app. Media is recorded internally to a 16GB microSD memory card. The Phantom 3 Advanced relies on a GPS-based navigation system to maintain flight stability and provide other features because of the complexity associated with multi-rotor device. It is important to note that fully manual operation is possible. However, most pilots will opt for one of the GPS-assisted modes, especially videographers hoping to get the smoothest possible shoots. Pilots can also safely operate the drone inside with the vision positioning system. This technology uses a specially designed camera as well as sonic waves and even when GPS is unavailable, it allows the drone to hold its location, stop when the controls are released, and quickly respond to pilot commands. The Phantom 3 Advanced features Auto Landing feature, which allows the drone to the exact spot that it took off from when the GPS is available. The drone also comes with Auto-Takeoff feature, which allows the drone to turn on its motors and raise to a pre-set height. The drone will then hover in place until you direct it where to go. Phantom 3 Advanced is equipped with a powerful 15V 4480mAh Li-Po battery and has a flight time of about 23 minutes. It also features a sleek design and users report that it is easy to fly. 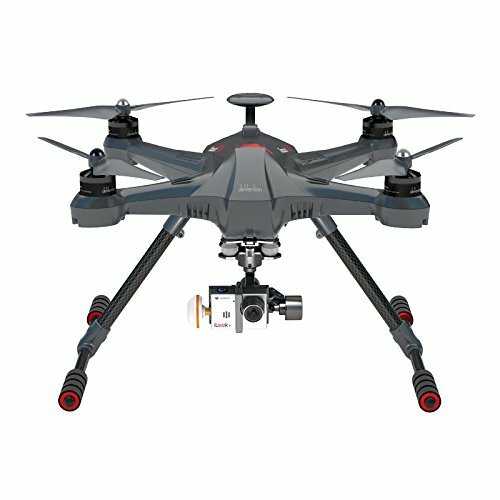 The Q500 4K Typhoon is designed for APV – aerial photography and video. The drone comes with the CGO3-GB, a 3-axis gimbal-stabilized camera with UHD 4K video recording at 30 frames per second. In addition to 4K, the camera can shoot 1080p at up to 120 frames per second for slow-motion, and 12MP stills capture. It comes factory-assembled and that a pre-bound transmitter/ground station unit is also included. The transmitter has a built in screen, which allows you to compose your shots properly. The GPS features are standard as with all advanced GPS drones. The drone features Follow Me, Position Hold and Return To Home. It also features Watch Me. This amazing feature allows the quad to always keep a particular object in frame. The drone comes with two 5400mAh flight batteries, providing up to 25 minutes flying each per charge. The Q500 also features Smart Mode. This mode is designed for newbies and uses GPS to establish 8 meters “SAFE Circle” around the pilot. It also comes with Angle Mode that provides more control and steeper bank and pitch angles. This feature is optimized for advanced pilots using the drone for aerial photography. It is important to note that the US version of the Typhoon Q500 takes FAA regulations into account, which means that it won’t fly in no-fly zones. This mode also prevents the drone from flying more than 400 feet above the pilot and more than 300 feet away from the pilot. This mode can be turned off. However, it’s not recommended to do so if you are a beginner pilot. 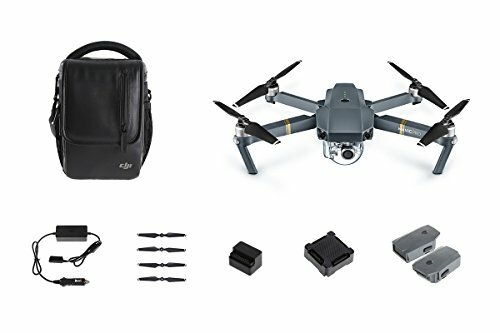 The DJI Mavic Pro is an amazing folding drone that is small enough to fit in your pocket when folded up. On the other hand, when this drone is opened up it is large enough to give stable, smooth flight. This compact drone is snappy, agile, and shoots high-resolution images. It packs features you once thought possible only on much bigger platforms into a compact quad. The Mavic Pro features an advanced flight control system that draws on a host of sensors to keep track of where it is flying in 3D space and even avoid collisions. Some of these features include a ground-facing camera, ultrasound, GPS, dual redundant IMUs, etc. The Mavic Pro camera captures 4K video at 30 fps and Full HD 1080p at 96 fps. This amazing camera allows you to create incredible slow motion. The camera is also perfect for everything from the ultimate aerial selfies to landscape shots due to its minimum focusing distance at just 19″. Every photo you take with this drone can be as big as 12MP and you can even flip the camera 90-degrees for portrait oriented shots. This drone can even recognize gestures for the perfect selfie. The DJI Mavic Pro can be controlled just by your phone itself. However, it is best operated when using the remote control and the phone, which requires that you download the DJI Go app onto your phone. Once installed, you can operate the Mavic Pro up to 7,000 meters away from you. On the other hand, your range will be cut to around 50 meters if you are just using your phone. You’ll become a professional photographer in no time with the Mavic Pro because it has 27 minutes of flight time, and the fully functional DJI app to go along with it. But remember, it is very important that you fly safely and smart! Check out the Mavic Pro here: https://goo.gl/UEk9q9 Austin and Alex review a production model of the brand new DJI Mavic Pro drone ahead of its release! 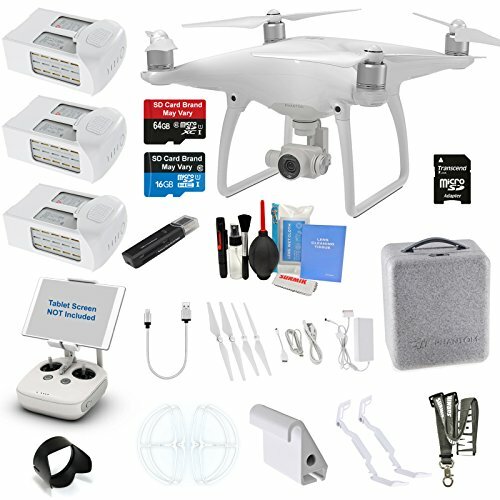 The DJI Phantom 4 is an all-around amazing drone that features a sleek new design with magnesium unibody construction, dynamic range enhancing video modes, obstacle avoidance sensor, a two-point-of-contact gimbal mount and many other amazing features. 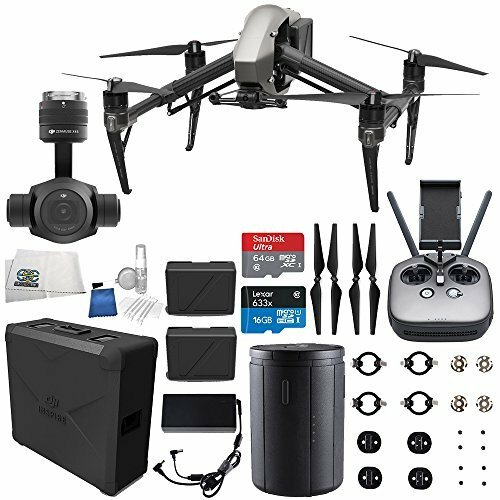 This awesome drone has GPS and a built-in HD camera that captures DCI 4K video at 24/25 frames per second and UHD 4K (3480 x 2160) at up to 30 frames per second. In addition, the Full HD mode enables recording at up to 120 frames per second. This is perfect for creating slow-motion effects in post. The camera will also capture 12MP still images in either DNG RAW or JPEG. The camera is stabilized with a gimbal, so the video will be smooth and straight no matter which way your quad is tilted. The Phantom 4 relies on a GPS-based navigation system because of the complexity associated with multi-rotor aircraft. The drone has a very accurate GPS chip and sensors that allow you fly it easily and smoothly. The drone draws upon up to 24 satellites to maintain flight stability and provide other useful features. While fully manual operation is possible, most pilots will opt for one of the GPS-assisted modes, especially videographers hoping to get the smoothest possible shoots. 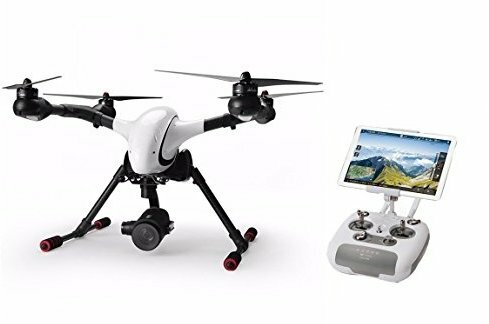 The DJI Phantom 4 combines the features of a separate remote control with the ease-of-use of a Smartphone and it is best operated when using the two in combination. However, the requires that you download the DJI GO app that will let you plan flights and give you unprecedented control over how your quad flies. It also allows you to see what the camera is seeing because it streams video from the camera direct to your Smartphone. You can also simply tap on the screen to make the drone fly to that location. The app also records comprehensive flight logs of every flight you take. The Phantom 4 also features Vision Positioning System that provides comparable stability function indoors or relatively close to the ground by using dual downward-facing cameras and dual ultrasonic sensors. The drone also has a built in failsafe. This feature is extremely useful because it will automatically bring the drone back to where it took off from if the battery is running low, or if you fly out of the radio’s range. The quadcopter boasts up to 28 minutes flying time thanks to improvements in efficiency as well as its intelligent power management system and it can achieve a top speed of 44.7 mph with its Sport Mode. The Walkera Scout X4 is more than just a flying action camera platform. The quad features a GPS-enabled flight controller, the G-3D 3-axis gimbal, and a Bluetooth datalink for ground station access. The Scout X4 features a new advanced GPS flight control system that allows for 1 button start and hold feature. It also allows for a more accurate flight along with terrific GPS position holding. The drone also features Failsafe Return to Home. This feature is extremely useful because if the signal from the transmitter is ever lost this feature allows the drone to automatically fly back to the “home point”. You can fly with GPS assistance for full auto-pilot redundancy or you can get better manoeuvrability by switching over to manual. GPS is not used in manual mode. However, the gyro, altimeter, accelerometer, and other sensors are still used to help in flight stability. It also has other features you’d expect from a GPS drone, such as position hold, route planning, return to home, and follow-me. The Scout X4 comes with the Walkera iLook+ camera. This camera can both shoot film at HD 1080p video and at 30 fps and transmit it via 5.8 GHz to the receiver built into the radio. You also get a 3 axis gimbal that also works with the GoPro HERO3, HERO3+, and HERO4. The gimbal will stabilize the camera and let you capture amazing aerial footage. The drone also features retractable landing gear to supplement quality aerial image capture. The landing gear can be raised in flight to provide the camera an unobstructed 360° view. The Scout X4 is equipped with a huge 5400 mAh battery that lets you fly for about 25 minutes. This amazing quadcopter is a little bit on the expensive side. However, it may be worth the price considering all the things you are getting in this package deal. The DJI Inspire 2 is a powerful cinematic and photographic tool. The drone has an all new image processing system which records at up to 5.2K and it is sure to be the darling quad of pro filmmakers, local news stations, and deep-pocketed enthusiasts. The DJI Inspire 2 has a fixed, built-in camera that is stabilized by a 2-axis gimbal. The camera faces forward and its sole purpose is to provide a forward video feed to the pilot at all times. The camera that is actually used for video capture is stabilized using a 3-axis gimbal and hangs underneath the body. There are two camera options available for this drone. The first is the Zenmuse X4S that uses 1-inch 20MP image sensor, 24mm f/2.8-11 lens, and mechanical shutter and its fixed field of view covers about the same angle as a 24mm lens on a full-frame camera system. The Zenmuse X5S is a premium option. It is perfect for videographers who require the flexibility of interchangeable lenses. This camera has a dynamic range of 12.8 stops and it supports up to eight standard M4 / 3 lenses with focal lengths ranging from 9mm-45mm, allowing more creative flexibility. Flight Autonomy provides two directions of obstacle avoidance and sensor redundancy and it has been revised and developed specifically for the Inspire 2. Increased intelligence adds multiple intelligent flight modes. This gives even single pilots the ability to create complex, dramatic shots. The drone also uses both GPS and GLONASS satellite systems. This system can locate up to 24 satellites giving you a faster connection to satellites and more accuracy. The DJI Inspire 2 features Spotlight Pro. This is a powerful tracking mode that uses advanced visual tracking algorithms to lock onto a subject during flight, regardless of the direction that the drone flies. This feature allows even single pilots to capture complex, dramatic images and creates shots that would once have required a dedicated camera operator. The drone itself will rotate in the same direction if the gimbal comes close to reaching its rotation limits. This will not affect flight control or the shot being captured to free up gimbal movement. When set to Sport mode, the drone can achieve top speed of 67mph and 0-50mph acceleration in 4 seconds and the dual-battery system keeps the Inspire 2 in the air for about 27 minutes. The Voyager 4 was released in the summer of 2016 and it is the latest professional drone from Walkera. The drone has 16 lenses that allow it to focus on small spots from the sky. The DJI Inspire 1 is other drone on the market that has an option for a zoom camera – Zenmuse Z3. However, this camera is only 7x optical zoom. The camera records 4K video. It can rotate 360 degrees and is stabilized by a gimbal. The Voyager 4 features dual positioning system (GPS and GLONASS) in order to allow intelligent flight modes (like waypoints mission). To enable a more stabilized footage, this drone has a newly designed 3 axis brushless gimbal. It uses an advanced shock absorption gimbal technology that greatly reduces vibration and movement during flight. This enables the camera to shoot stabilized and fluid footage even after magnifying the focal length. The manufacturer decided to deliver this quadcopter together with their latest F18 transmitter. This transmitter has amazing control range and it also has many aerial filming orientated features. The drone can be configured to operate over its own Wi-Fi network. On the other hand, it can also be configured to use 4G GSM internet giving it roughly unlimited control range. Voyager 4 represents the pinnacle of Walkera's 12 years of radio control aircraft design, a unique fusion of both aerodynamics and aerial video technology. The GPS chips and advanced flight controllers that drones now have are incredibly complex. To keep you in the air they do thousands of calculations per second. However, you should know that GPS is not foolproof and you should think if it more like a backup plan. You should not rely solely on GPS as your safety net and you must practice and become proficient at flying without GPS. If you are using GPS return to home every time you want to land you are doing it wrong because drones are machines, and like all machines, things can go wrong. The GPS chip alone does not hold the drone’s position because GPS can only see where the drone is in terms of two coordinates – latitude and longitude. There will usually be a series of lights that indicate whether or not the GPS has a lock when you start up your drone. It is very important to take off only after the lights confirm that the GPS signal has a lock. If you don’t do that, your drone won’t fly properly, or worse, it’ll fly away. The GPS chip doesn’t let the drone know which way the drone is, how high it is, or which direction it is facing because each of those data points has a dedicated sensor. The flight controller relies on accelerometers to help it judge which way the drone is. Accelerometers are calibrated when you start your drone up. To let the sensors initialize properly you need to keep it on a flat surface for a couple of seconds when you power it up. Your accelerometers are out of whack if your drone seems to drift around a lot more than usual. This means that you should refer to the instruction manual for how to calibrate them. The direction that quadcopter is facing is detected by an onboard magnetometer and calibrating the magnetometer is very important. If this is not done correctly, your drone won’t know which direction to fly in if you do an emergency return to home! You usually turn the drone around on all of its axes to calibrate the magnetometer. This means that you flip it forward 360 degrees, flip it sideways 360 degrees, and rotate it 360 degrees. All of these sensors are usually calibrated together in your start up sequence and it is very important to follow the instructions to the letter and calibrate every time you fly!